A tagine (or tajine) is an iconic Moroccan dish which is named after the conical clay pot in which it is traditionally cooked. 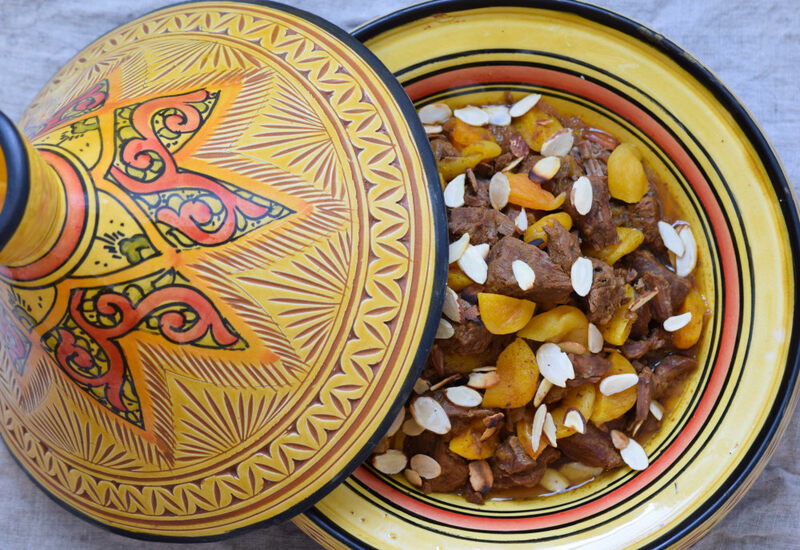 A classic tagine is typically slow-cooked for hours in this earthenware pot consisting of two parts: a flat, circular base with low sides and a large cone-shaped cover that sits on the base during cooking. This design is meant to keep the meat moist, however, a modern pressure-cooker can deliver the same rich flavor and fall-apart tender beef in a fraction of the time! In this version, apricots, honey, and a mix of bold spices give this stew a sweet, gingery complexity. Finish with sliced almonds for beautiful presentation and tantalizing crunch. Heat olive oil in pressure cooker set to Sauté on Normal. Cook and stir the onions in hot oil until softened, about 3 minutes. Stir beef with the onion; cook until browned, about 2 minutes per side. Stir cinnamon, paprika, turmeric, salt, ginger, allspice, and anise with the beef and onion; cook and stir until aromatic, about 2 minutes. Pour water and honey into the cooker. Lock pressure cooker lid in place and set steam vent to Sealing. Select Meat/Stew and cook for 50 minutes on High pressure. While the beef cooks, soak dried apricots in hot water in a bowl until softened. Heat a skillet over medium heat. Toast almonds in hot skillet until just lightly browned, about 3 minutes. Once the cooking cycle has completed allow pressure to release naturally for 15 minutes, then set steam vent to Venting to quick-release remaining pressure. Drain apricots and stir into the tagine. Sprinkle toasted almonds over the tagine to serve. Star anise has a powerful and liquorice-like flavor that ensures an authentic touch in the preparation of certain dishes. The whole stars can be added directly to the MultiPot Pressure Cooker. Just be sure to find the whole star and remove before serving. Per Serving: 654 calories; 27g fat; 30.0g carbohydrates; 77g protein; 225mg cholesterol; 466mg sodium. I had made a tagine once with lamb and it was one of my favorite discoveries, so I was naturally intrigued by this beef version that seemed similar enough. Plus, I look for any excuse to use my pressure cooker! This really is a top-notch recipe. The pressure cooker makes the beef tender fairly quickly, and the spice mixture, honey, and apricots do amazing work together. It's very flavorvul, though not so much so that the kids wouldn't eat it. Great dish! We have a tagine pot that we have used a couple times, but this method cooking it in the pressure cooker quick and convenient. I couldn't tell the difference between this and the recipe we would have used in the clay pot. Very well done, true to flavor, and delicious. I've always wanted to try tagine, but never had the right pot to cook it in. So excited to have found this recipe! I tried making this dish in my pressure cooker and it was fantastic. This stew was very succulent - sweet and savory all in one. Such a wonderful dish, I can't wait to make again. Used fennel instead of star anise. It’s somewhat hard to find at regular stores. I’m somewhat of a purist so making tagine using a pressure cooker is what I gave this four stars, but still it was a good recipe. Never been a fan of star anise so I left it out. This dish was really flavorful still. It’s hearty and full of flavor. Can I use this recipe with chicken instead of beef? This dish has good flavor with low sodium. I found it classified as a “one pot” meal but it definitely needs more to be complete meal—it’s just meat with a flavorful sauce. You’ll at least need bread or rice to serve with it. I might try adding chickpeas, potatoes, or hearty greens to the pot next time to help round it out as well.